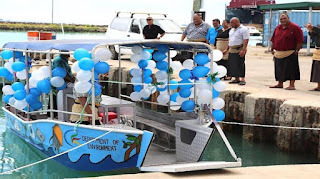 Tonga’s Deputy Prime Minister Siaosi Sovaleni launched the R2R Marine Monitoring Boat in a special ceremony today. 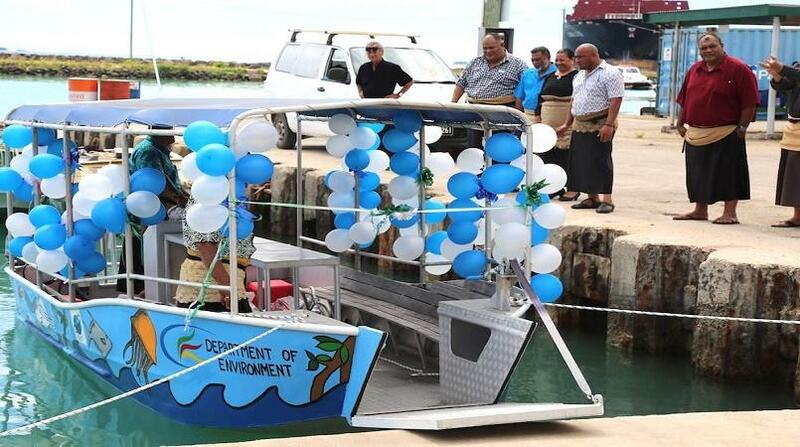 The boat will be used for all the project’s marine monitoring activities for the Fanga’uta Lagoon Plan as well as related activities under the care of the Department of Environment. Sovaleni said the boat will assist greatly the efforts in monitoring the marine ecological health to inform decision-makers of the reality of our natural resources in Tonga. “I know that at times these activities seems like small drops of actions, but they all add to a strong torrent of systematic care towards our environment, which is the legacy with which we leave our children,” Sovaleni told guests at the Ngutulei Restaurant on the Faua Wharf. He highlighted the R2R project and its progress so far, adding the project has achieved a number of milestones, with the boat launch being a new one this year. “The Ridge to Reef Program, under the Department of Environment since its commencement in full operation in 2015, have finally come to another milestone of achievements in 2017. First is the establishment of the Environment website in January, and secondly the recent approval of the revised Management Plan for Fanga’uta Lagoon Catchment called Fanga’uta Stewardship Planby the Steering Committee in March,” he said. While the boat had been purchased in 2015, the parts were assembled late last year and tested early this year before the launch was finalised. Sovaleni thanked all the development partners, including UNDP. He also thanked the various Management Committees of the Ridge to Reef Program and all partners. The launch was attended by the Chief Executive Officer for MEIDECC, Mr Paula Ma’u and other ministries including Land and Survey and the Ministry of Agriculture and Fisheries. Members of the Fanga’uta Lagoon Technical Working Group also attended the launch, which was held after their meeting earlier in the morning. Reverend Tevita Ngungutau Tapueluelu officiated at the launch event and blessed the occasion. Guests were then taken for a ride on the new boat by Sam Tatafu of the Deep Blue Diving, who has been assisting the R2R project and the Department of Environment in training staff to operate the boat.